Don't forget that on the Canadian side of Lake Huron you have Manitoulin Island - sacred to all North American/Canadian first nations people. Manitoulin also contains the only unceded territory north of the 49th parallel. Close by on the mainland there is the Bruce Peninsula on Lake Huron which to this day has a large number of Indians on the Cape Croker reserve. This whole territory is renowned for its natural unspoiled beauty, rare flora, etc. And of course the original aboriginal people are just beautiful beings. Just this summer my wife and I rented a cottage up there for a week. A Lama friend from the large Tibetan community in Toronto was curious to meet "real" native Canadians so he came along too. You may perhaps have met him as he was still at Tsurphu back in the 1990's. 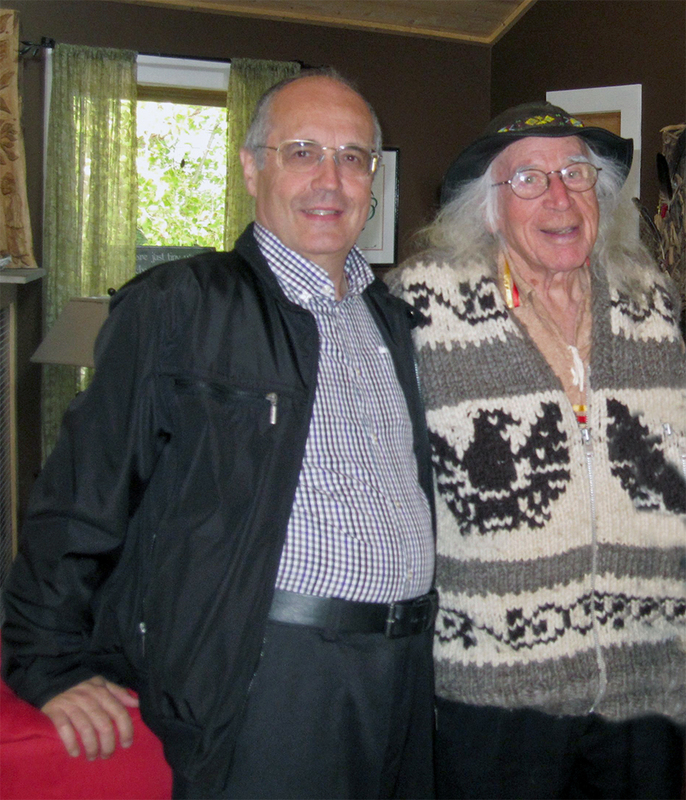 Years ago I had met Chief Wilmer Nadjiwon - hunter, carver, trapper ,and gifted native sculptor - and was able to reconnect on this trip and introduce our Lama friend from Tibet. Well these two just dove right in the deep end - they had so much to share, this Lama from Tibet and a ninety year old Indian chief. They felt they had so much in common culturally - love of horses, drums, long hair, turquoise, chanting, respect for Mother Earth etc., etc. . . .
One thing that sticks in my mind is how Chief Wilmer saw everything around him as being alive and sacred - the bush, the trees, the rivers, lakes and hills. Both he and his family had an intimate effortless knowledge of all of the plants and herbs. Many of the things we ate that day had just come from the woods around their home. I grew up in the West of Ireland about twenty miles or so from the Atlantic and spoke fluent Gaelic when I was young. In those days we never had the slightest doubt that there were sacred places all around us. We knew about them because there were first of all so many existing megalithic monuments from the Celtic era of the ancient Druids. We also had a living oral tradition of story-telling that had not yet died out in the West of Ireland. And of course we had endless folklore collections as well as nationalist programming at school filling our young minds with the stories of mythological heroes. But really we knew about these things because there was an instinct, a vitality, an indescribable something in the air that resonated inside us - especially so when we were young and not yet polluted by a fine Catholic education and the rigors of boarding school discipline. As I write I look down and see a beautiful photo sitting here of Choje Lama Namse and shudder to think how far I have come and how fortunate I am to have finally found my true teacher after a life wandering in the wilderness. It pains me to think how many of my friends suffered so much and never escaped to this day from the strait-jacket of Catholic indoctrination and institutional abuse. But that is a different subject altogether . . .
What sticks in my mind the most is how the very language we used was so vivid and precise in it's use of place names. They literally communicated the essence of a location. A string of place names would come alive once you knew a little history or actually visited the location and saw how the topography was reflected in the name. In my case I was born in a place called Tuam which in Gaelic is 'Tuaim Da Gualainn' - meaning the place of burial between two mounds or hills. And of course that descriptive place name conforms exactly to the history and geography of the town. One of the hills, Knockma, outside town contains the burial place of Queen Maeve of Connaught - a legendary warrior - and is generally reputed to be where the King of the Fairies holds his court. My mother was born at the bottom of the hill and so her childhood - and consequently mine also - was full of tales of the unseen world and the need to respect holy wells, sacred sites, fairy trees and mother earth in general. We never questioned the fact that certain places were sacred. Croagh Patrick - twenty odd miles up the road from where I grew up - is a good example of a pre-Christian place of worship that was co-opted by the Roman Church and continued as a place of pilgrimage way before anyone ever heard of Lourdes or Fatima. One enterprising young contractor - our neighbor and one of my brother's closest friends - purchased some land to build a house for his new bride. It contained a fairy tree - a real one that we all respected and actually loved. It just had what we would call an aura or vibration these days, but back then we had neither the terminology nor the benefit of a genuine spiritual tradition that could explain these things. But everybody knew that "J….. F…….." (yeah, I still remember the name after all these years . . ) should not touch that fairy tree. Of course that's precisely what he did - dug it up with some kind of backhoe and built a house the likes of which we had never seen in those parts - a bungalow with marble exteriors. The house even had central heating which most locals had never even heard of before. Anyhow, "J.F." married his bride and they moved into the house and sure enough within a matter of weeks he was killed in a car accident. I knew his wife's family quite well - they and the whole town had little doubt that our man had gone up against 'the little people" and came out losing. In my own case I was born on Ballygaddy Road which translates from the Gaelic "Beal Ath na Gadai". This means the "the thieve's ford at the mouth of the river" just down the road - not far in fact from where "J.F. 's" house still stands today. His bride as far as I know never remarried and lived out her days in their marital home. Thank you for your articles which I dive into and drink from time to time. Don't ever stop - I'm sure there are many people out there who tune into your Dharma thoughts and tales and are gladdened and nourished by your contribution.